Once we found ourselves with a working kitchen, the speed of our kitchen updates dropped significantly. Since all the projects that were left were small ones, we took the approach of getting to them a little at a time, when we had a few free hours on a weekend here and there. In time, we added floor trim, vented the microwave, installed cabinet hardware, put in toe kick under the cabinets, put in a new fan (a Hunter fan found at a thrift shop and painted), added pendant lights over the peninsula ($15 each from Ikea), and finally put in the back board of the peninsula. This whole time of smaller updates, I used the kitchen daily. Luckily, the layout was working great, and I was enjoying all the space. But, I felt like something was missing. I had always thought that we would need an island of some sort, but I knew putting in a permanent island would make the space tight. If we had an island similar to the peninsula (basically, cabinets with a countertop), I worried that the kitchen would look and feel cramped. But, after using the kitchen for a while, I thought an island would be really functional. The kitchen worked well if was just me cooking, but not if Dan joined me in the kitchen. The main working space was the peninsula area, and there was only space for one of us to work at a time, especially if I was doing something that took up a lot of space, liking putting cookies on a cookie sheet. While we had other countertop space, none of it was really that functional as a prep space. I looked at some islands that were selling at Crate & Barrel and Target online, and measured out the available area we had in our kitchen. I took some painter’s tape and taped out a rectangle on the floor to get an idea of how adding something to the middle the room would look. After a few weeks of tape on the floor, Dan reluctantly agreed we could look into purchase a moveable kitchen island off craigslist. His reasoning was that we could try a piece of furniture in the space, but if it didn’t work (meaning, he thought it was too cramped in the kitchen), we would just re-sell it. 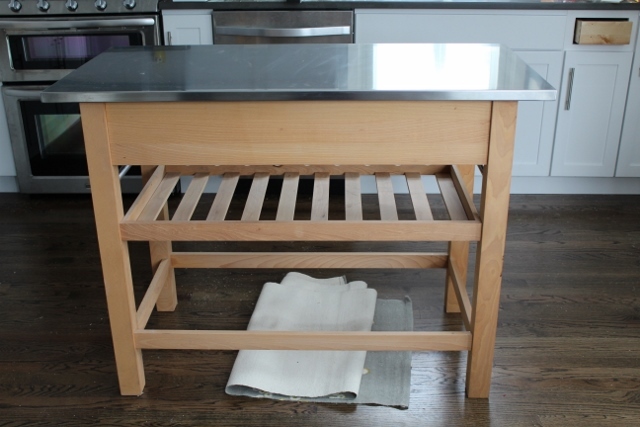 After a few weeks of looking, I found an older model of this Crate & Barrel Sheridan Kitchen Island. I liked that it was open on the bottom, so hopefully, it wouldn’t looked sandwiched into the space. While the new model of the island was about $700, we were able to negotiate with the sellers to pay only $190 for the older piece. We picked it up, fit it into our teeny car, and got it home and into the kitchen. I knew I didn’t want to leave the raw wood unpainted, but, I also didn’t want to invest the time into painting it, then decide it wasn’t working for us. So, we left the island as it was for a while, to see if we liked it. I loved having the extra prep space, and even Dan had to agree it helped the kitchen be more functional. After a few weeks, we decided to make it a fixture in our kitchen. We were keeping it. Now came the task of figuring out what paint color to use. We quickly discussed and dismissed painting the island white. 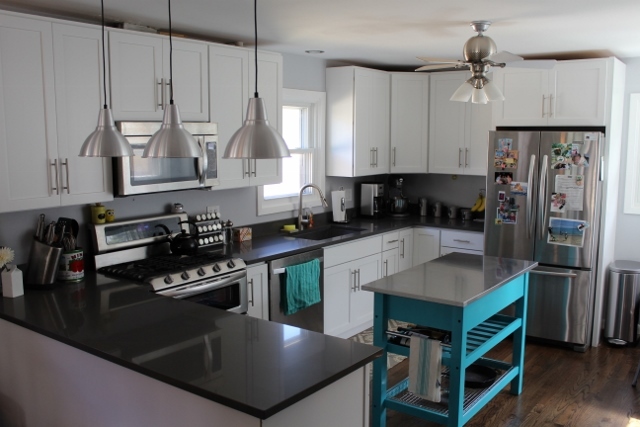 Our kitchen was already white (cabinets and pedestal table) and grey (countertops). White would just look like more of the same. Grey was thrown out as well. With the stainless steel top, I wanted the island color to contrast, not blend in with the countertop. I took a quick look on pinterest and noticed many of the kitchens I was drawn to used a pop of color to really make their kitchen unique. To me, if you’re going to add a bold color to a space, it needs to be in an accessory piece. Like, you get a radioactive yellow pillow, not a radioactive yellow couch. Why not use the island as the kitchen’s pop of color? Sticking with our house color scheme, I knew we’d want something in the blue family. I thought about using the same blue color that I used for the pasta frames and cucina sign, but I thought the color was too dark. I wanted something bright, almost neon. 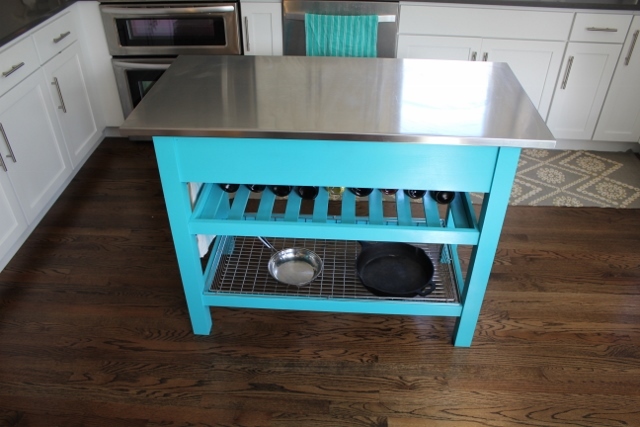 We perused the blue spray paints (we thought spray paint would give the island a better, more even, less brush stroke-y look), and decided on Rust-Oleum’s Caribbean Blue to give the kitchen that little something extra. Bright, right? I thought that at first too, when I saw a couple coats of paint on it. But, I told myself that once we moved the island into our very neutral colored kitchen, it would complement the space nicely…I hoped. After three coats of spray paint and one coat of sealer, the island was ready to move into the kitchen. Not too shabby! I picked up some inexpensive blue colored kitchen towels (seen on the dishwasher and hanging on the island), just to finish the look. We have other towels too, so everything doesn’t always look matchy-matchy. Believe it or not, the kitchen remodel STILL isn’t finished at this point. Items remaining on our to do list: adding under cabinet lights, installing the backsplash that’s been sitting in our garage for months, creating built-in kitchen bench seating, adding trim to the top of the cabinets (which has also been sitting in our garage for months) and finding a free-standing large shelf/cabinet for a bare corner. Still a lot to do, but we’re miles away from where we started.